Neely Williams, MDiv and Jabári Ichimura both presented at the PCORI Annual Meeting in Washington, DC. NASHVILLE, Tenn. Jabári Ichimura and Neely Williams, MDiv both want their efforts to benefit the community. Ichimura, Clinical Translational Research Coordinator III for the Meharry-Vanderbilt Alliance (MVA), utilizes his knowledge and skills to improve healthcare. Likewise, Williams, a Community Partner with the MVA with a lineup of public service groups in her background, has ever been focused on community efforts and initiatives. 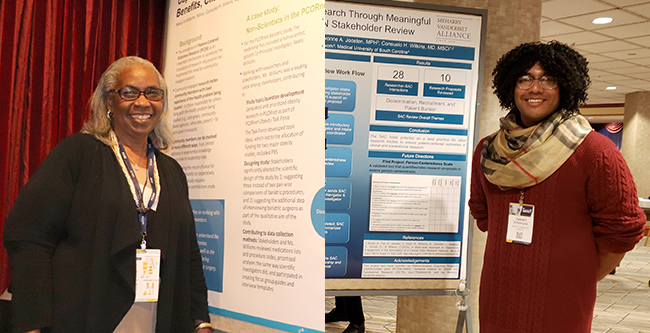 On October 31 – November 2, 2018, both focused their efforts on patient-centered research at the Patient-Centered Outcomes Research Institute (PCORI) Annual Meeting in Washington, DC. The conference was an opportunity for collaboration between a younger research fellow and a senior community liaison, blending fresh eyes and new insights with seasoned experience and passion to serve vulnerable people in research. Ichimura’s skills in technology and project management allowed him to teach, while Williams’ techniques for preparing her presentation was vital for creating a professional product. This shared experience was a chance to build stronger community and academy institution relationships, which serve as the foundation for greater patient-centered research. “I was selected by PCORI to present our stakeholder engagement process of reviewing research proposals that come through the Mid-South Clinical Data Research Network (MS-CDRN),” Ichimura explained. His presentation, “Influencing Patient Centered Outcomes Research Through Meaningful Stakeholder Engagement: The MS-CDRN Review,” highlighted the process of requesting and accessing patient data through the MS-CDRN Stakeholder Advisory Council. That council, he said, consists of patients, physicians, community health workers and more who assess whether or not investigators have a patient-centered aspect to their research. Williams, meanwhile, gave a presentation that discussed helping patients make better healthcare choices, specifically with regards to bariatric surgery for weight loss. Her presentation, “Decisions, Decisions: How CER/CPCRO Is Helping People Make Better Informed Healthcare Choices,” looked at the amount of weight loss maintained after the procedures over a five-year period and its impact on diabetes. “Usually, people who have Roux-en-Y Gastric Bypasses Sleeve Gastrostomies become non-diabetic fairly quickly,” she noted. PCORI was established to research that can helps patients and those who care for them make the best-informed decisions possible about healthcare choices that reflect their desired health outcomes. Since 2012, the organization has funded hundreds of studies comparing healthcare options to learn which works best, based on various patients’ circumstances. The annual meeting brought researchers, patients, and healthcare stakeholders from around the country together to discuss ways to continue helping investigators and patients make informed healthcare decisions. Williams has lost and maintained a 130 pounds weight loss over the last seven years. She had five major surgeries after her initial bariatric procedure. “It’s quite possible that I would not have been able to have these crucial surgical procedures at my former weight of 400 pounds,” she said. Williams believes her work on local and national levels for patient-centered engagement research was enriched by her time in at the conference. She suggests that her future work as a community co-investigator of the Mid-South CDRN, and on the steering committee of PCORnet 2.0/People Centered Research Foundation (PCRF), will draw heavily on this work and build on it.